A feature of this website is the inclusion of personal experiences of the topic under consideration. This makes it possible to include different perspectives, including accounts from professionals and consumers, and different views on decisions that have been made. We welcome these contributions at any time, and guidance for contributors is given in the ‘overview of the project‘ section. We are also happy to include here links to signed contributions. In Account 1, Sandra Smith, who is deaf and the mother of four deaf children, challenges assumptions about normality that can be made by professionals. Account 2 looks at the implications of diagnosis taking place some time after parents had suspected that something was wrong. This could be different for different parents and a source of doubt, anxiety and/or confusion. Account 3 looks at the diagnosis of Ben at 10 months and how deafness could come to be understood as not just a disability but a medical and/or social problem. There have been Deaf people in my family for six generations and my ancestors can be traced back to the village of Bisley where Thomas Smith was born in 1824. I have five children, the four eldest are all deaf. ‘No’ said the audiologist, ‘he’s hearing’. In 1968 I was invited by the NDCS to carry out an interview study with parents of deaf children under 6 years. The interviews were carried out in the late 1960s and the following are comments about the experiences of the diagnosis of their child’s deafness made by the parents at the time. Some parents had suspicions from early on that there was something different about their child although they were not necessarily sure what it was. 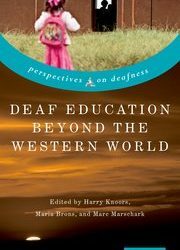 For them the diagnosis of deafness was often a relief in that it was not something worse, or relief that there was an issue and they were not imagining things. It came as a… well I thought perhaps there was something the matter because he weren’t… well I’d had two before and I know no kids are the same, but he was completely different. He never used to play with boys, he was more interested in knocking things down, you wouldn’t get him to sit down and play with anything, he was ever such a strange child. He wouldn’t talk; he wouldn’t go to nobody, only me. Not even his Dad. I wouldn’t say I was shocked but I was glad it was that and nothing else. I was just sheer relieved to know that it wasn’t me going mad, at first. So many people had stood in my path and said ‘You’re whittling, you’re worrying – there’s nothing wrong with her, she’ll talk when she’s ready,’ I thought that if it went on much longer at home and that child was supposed to be normal, I’d go off me rocker. So really it wasn’t so much finding fault with anybody, or how it had been handled, it was just a relief to think at long last we did know that there was something wrong, and what it was, and could tackle it. I didn’t know how to handle her before that, I can’t really find fault. I wish really that they’d taken more notice when I’d first asked them when I was first worried, but I can see their point of view. She’d got a certain vocabulary. There must be hundreds of mothers with first babies that worry over everything they don’t do when they should, that they’ve got to really sweep with a broad brush, and say – well, come back. Others talked about their realisation that their child could be deaf and about their problems in getting anyone to take them seriously. I wasn’t told, I told them, and they didn’t believe us. We knew at nine months; Ray at nine months, you could shout and shout and he couldn’t hear. We took him to the ENT specialist, and he said he could hear. We took him at thirteen months and he said he could hear but he thought perhaps he had a slight loss. When I went to the Welfare a bit upset saying I was sure something was wrong, that I had to see a doctor there, they said if it would make me feel any happier they’d come to give her a hearing test. So they came. I didn’t think it was very satisfactory. It just showed up everything I’d worried about. You couldn’t get her attention. She seemed to hear – but you couldn’t keep her occupied for very long – she’d be wandering off while you were talking. And they said she was too young to test, but they thought she was all right, and they said to come back in six months if I was still worried, so I did that again you see. They asked what vocabulary she had at two and a half see, and I listed lots and lots of words and they just went by pure figures, that number of words was quite acceptable for a child of that age. And I said ‘Yes, but it’s not so much the words, it’s she doesn’t understand what I try to tell her, she’s never with me really.’ And they said ‘Come again in six months if you’re still not happy’, which would have been when she was about three, but before she got to three, a few months before, I just couldn’t stand it any longer. I knew something was wrong and I had to have a bit of a show down then to say ‘You either try and find out for me, or tell me where else to go this time.’ I went round intending to really find out something that time and she said ‘Come the following week when the doctor would be there and she’d fill you in’. And I wasn’t in there very long on that occasion. The nurse went to talk to Jane herself, being older – ‘Would you like a sweet, Jane?’ from this distance with Jane’s back to her. I said ‘You’re wasting your breath.’ She said ‘Why?’ I said ‘You’ve got to tap her to get her on our level, and just say “Sweet” – that’s all she understands’ and she said ‘Don’t you think she’s deaf?’ And I had an appointment for the next week, and four hospital appointments in the next month and things really got moving. As soon as possible. I mean you don’t want to go believing he can hear when he can’t, do you? I don’t know really. I suppose it’s best to know as soon as possible although I enjoyed the time, looking back, when I was ignorant of the fact, obviously. I often think back, and wish I was back in those days when I didn’t know anything about it. Because when they’re babies they just act and react normally and you don’t jump to the assumption that there’s anything wrong – you don’t think it’s going to happen to you – do you? Lorraine is a teacher and later a Teacher of the Deaf, mother of Sarah who is hearing and Ben who is deaf. Ben was born in 1980 and diagnosed when he was 10 months old. The following is taken from her book ‘A Language for Ben’ based on her diaries. We haven’t thought of Ben’s deafness as a medical problem, yet because of it he has been into hospital, had an operation, he has had a foreign body embedded surgically into his eardrum (editor’s note: insertion of grommets), and here we are, having a discussion with a woman in a white coat about equipment. It feels strange. After all, Ben is not ill… or is he? Is he? Is deafness an illness? Perhaps sensing that we are not really listening any more, the audiologist gives us a telephone number so that we can call her if we need any more information. Then she asks us if we would like to meet the social worker; the consultant has arranged for him to be there in case we need him. The social worker? Ray and I look at each other in amazement. Ben has a medical problem, and now, it seems, we have a social problem. I don’t know whether to be amused… I am certainly confused. The social worker seems to be prepared for confusion – but not amusement. He is very quiet, very grave; he talks of grieving. But, for me at least, he is about six months too late. 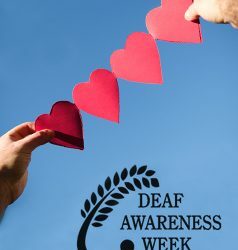 The closest I have come to grief was when the idea of deafness was still new to me, when I saw it as a scar on my beautiful baby, when I coped with it by forgetting about it, when I was desperate to know, but would not look beyond the knowing into the future. The social worker is treating us as if yesterday’s diagnosis were a bolt from the blue – yet how can it be a bolt from the blue when it has been expected for so long? The extended period of testing gave us plenty of time to get used to the idea that Ben might be deaf – not that he was deaf, but that he might be. As our suspicion grew, gradually, so confirmation came, gradually, a little with each test. Far more traumatic than this diagnosis was the one we made ourselves as we sat in that soundproofed room with Ben when he was nine months old and watched, incredulous, as he played, oblivious to ear-splitting shrieks and bangs from the speakers behind him. If we were to experience any trauma, surely we would have been at our worst on that day, the day we realised just how deaf Ben was. Yet on that day we had to go home without even having the truth of what we had just seen officially confirmed: we were allowed, even encouraged, to go on hoping. 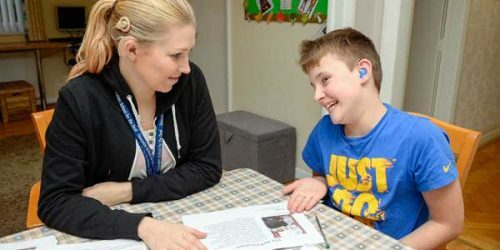 Even that seems light years ago now, as we sit with the social worker in his quiet little room and try to explain how we feel… how we knew about and accommodated Ben’s deafness for months without really worrying about it, how we have come to regard it simply as a difference, not as a problem. Denial can be harmful, says the social worker gently; if we hold back our grief and try to control it we are likely to suffer more later – and I can see the sense in that. I will admit that my defence system slowed down recognition of Ben’s deafness for a while, and that the day we realised how deaf Ben was our first – crazy – reaction was to buy him a musical radio – with moving pictures, admittedly – but, nevertheless, a musical box… but just now, I can’t find anything to grieve over. Yet the events of today have given rise to a new feeling, just there in the back of my mind. I struggle to dig it out, to categorise it. It’s a familiar feeling: butterflies in the stomach, buzzing in the head… It is fear. 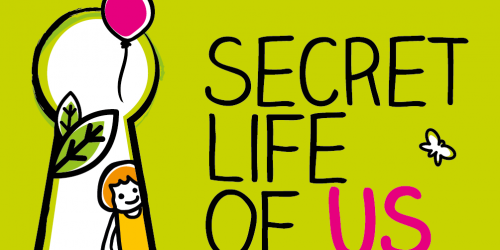 Not fear of deafness – I’m sure we have got over that – but fear of the unknown. We have grasped that there is much we have to learn; we have been told that there is a lot of work to be done, but we don’t even know what it is, let alone how to do it… Yes, there is something this social worker can do for us. We do need his help. He can help us to find out more. We have to discover what Ben’s deafness will really mean, for him and for us as a family, and what we can do to help him. Ray is on the same tack: he is asking, can the social worker recommend any books? The poor man is taken aback. Still worried about us, still not quite convinced by our calm reaction that we not in a state of shock and distress, he advises us against reading too much at this stage. This response does worry us. Does he feel that we should be protected from further knowledge? Is life with Ben going to be as dreadful as that? This extract is taken from Fletcher, Lorraine (1987) A Language for Ben. Published by Souvenir Press, London, in their Human Horizon series.